The original military plot reached through this arched gateway was once the property of the Board of Ordnance. The site, along with a similar one in Portsmouth, was built shortly after 1804 as an extension to the Woolwich Royal Laboratory/Arsenal . 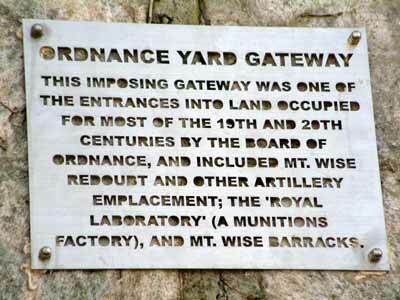 Later, by 1834, the Devonport Ordnance Laboratory was converted to barracks  and used by army engineers and tradesmen. Today at 2012 the resident of part of the plot is Knight's Surplus Stores; the rest of the compound was converted to housing sometime between 1975-1990. 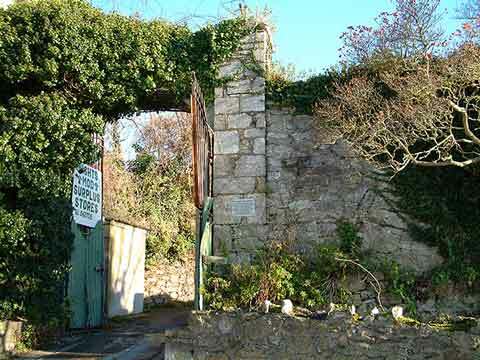 The gateway is located at the bottom of James Street, beside Mutton Cove. The plaque visible on the wall to the right of the arch is enlarged below. The Board of Ordnance ensured the Laboratory compound contained lots of separate, lightly-built, wooden structures; this was a safety point to minimise explosion fallout, on account of the munitions work carried out at the Laboratory (filling of shells and ball cartridges for example). Mount Wise Barracks inherited the various workshops vacated by the amunitions laboratory, one of which definitely became, by 1920 at least, a carpenters shop . The arched entrance shown on this page leads into what was the barracks' stables and horse-yard, and is now within the grounds occupied by Knights Surplus. It was probably the rear entrance and exit to the barracks, as the main entrance was at the opposite, eastern end, near the Redoubt. A fair amount of the boundary wall surrounding the barracks survives; this arch is in the western wall, the southern wall can be seen on Mount Wise hillslopes, just 100 metres walk from this archway, and some of the northern wall still stands at nearby Lock's Walk and Garrison Close. 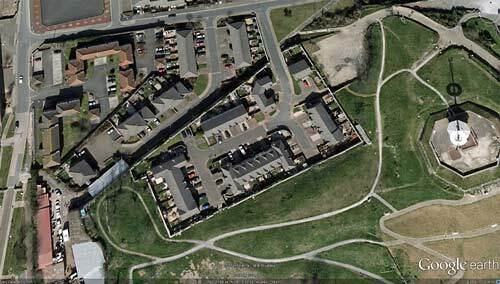 This last image is courtesy of Google Earth and shows the compound at Mount Wise. The street running top to bottom at far left is James Street (where the above archway may be seen), Prospect Row is across the top of the image, the octagonal structure at right is the Redoubt upon Mount Wise hillslopes. Jeremy Lake. Thematic Survey of the Ordnance Yards and Magazine Depots. Summary Report Thematic Listing Programme. January 2003. My grandfather, Royal Engineer Stanley Rogers, a master carpenter, worked out of the carpenters shop at Mount Wise Barracks when WWI ended - Liz Cook.